Up until now, this incredibly rare and special material was unobtainable to the collectors market - the last dealer fragments drying up several years ago. 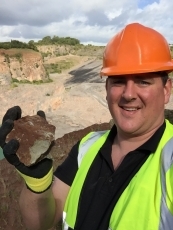 My re-discovery of the layer in 2016 at a new location in its quarry home now means that more collectors of meteorites and impactites can add this beautiful material to their cabinets. It is unlikely that more material will be retrieved, due to the extremely dangerous location of the layer now. If you haven't already, I suggest reading all about it in the May 2017 edition of Space Rocks magazine, which contains a 16 page article all about the re-discovery. This material is an impact layer deposit, containing material ejected by the impact that created the Manicouagan crater in Canada 214 million years ago. It is the only known deposit linked to that event found outside of Canada. Within the material, we find shocked quartz, shocked biotites and shattered garnet. 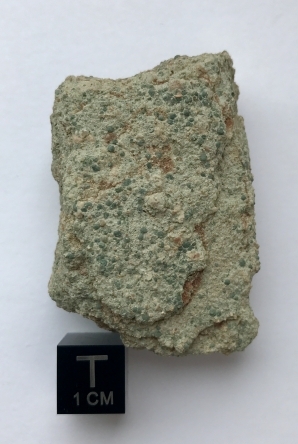 The most outstanding feature of this layer is the presence of tiny (0.5-1.5mm) greenish clay spherules, which started out as molten glass droplets. Contained in a matrix of mixed material showing how the deposit was quickly laid down. I have a range of slices, end cuts and natural fragment available, please see the specimens listed below. Contact me to purchase or for any questions at all. 60g - 100*40*8mm. Beautiful slice, with flowing and colours, pockets of high spherule concentration, spherules on outside edge. 139g - 153*45*12mm. Lovely thick slice, great colours & flowing features, very high spherule concentrations in some areas of matrix - light varnish. 215g - 124*55*25mm. Stunning large end cut, great flowing features and subtle colours, spherules throughout and on natural face. Interesting features in matrix. 85g - 100*40*10mm. Nice flowing, colours, heavy concentration of spherules in several locations. 92g - 110*45*10mm. Nice flowing, colours, heavy concentration of spherules in several locations. 135g - 130*40*13mm. Nice flowing, colours, heavy abundance of spherules at one end. 180g - 165*50*12mm. Stunning large slice, great flowing features and subtle colours, spherules throughout and on top edge. Interesting features in matrix. 179g - 170*50*11mm. Beautiful large slice, great flowing features and colours. Spherules throughout and on top edge. 34g - 38*50*9mm. In membrane box - georgous part slice, great flowing and colours, spherules in matrix and on natural top edge. 26g - 38*50*6mm. In membrane box - gorgeous part slice, flowing and colours, spherules in matrix and in abundance on natural top edge. 30g - 38*50*7mm. In membrane box - gorgeous part slice, flowing and colours, spherules in matrix and in abundance on natural top edge. 35g - 70*20*20mm. Nice little end cut, stands on its own. Spherules throughout and all over natural surface. 94g - 95*55*9mm. One of the best, got everything in abundance. 64g - 75*30*20mm. Amazing - stands on its own, beautiful colours and layering, very high spherule concentration at top and on natural surface.